your Table Top Autoclaves spore test 3 consecutive loads. 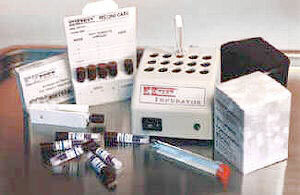 The sterilizer can be put into service after 3 consecutive tests show "No-Growth"
Do not order more than a 3 month supply. 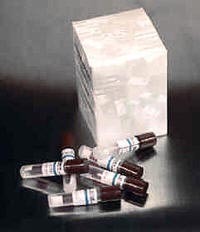 Expired Ampoules are not exchanged. react to critical parameters in the pouch. load towards the front and run your autoclave cycle as usual. Do not remove the ampoule from the pouch. Do not crush or break the ampoule. After it is sterilized do not open the pouch. Test Result Certificate mailed or faxed. How often to run a spore test or Test my autoclave. 1. On Jan 1 you sterilize a load with a non-expired Spore Test Ampoule in the middle of the load in its pouch. The ampoule is more rigorous than cotton covered in a glassine. 2. You send it in and later receive the result: Pass or Fail. Keep working. Consistently getting Negative Results each time you send in a spore test is STERILITY ASSURANCE. Your local Health Dept. determines how often to test, some weekly ( a waste of money since tools have never been implicated as a source of infection) , but usually monthly. If FAILED, the processing company WILL HAVE phoned you immediately. First: All loads processed since the last Passed Test are now suspect, do not have Sterility Assurance. Run three new separate loads and send the three spore tests in for testing. If you were a hospital you would be required to re-sterilize everything sterilized between the last Passed Test and the Failed date. Consult with local rules before making purchase. Some rules may prohibit self-testing. and are not to be returned for testing. These kits are for those who do their own spore testing. Repeated biological testing consistently shows no growth. Color after incubation shows results. Yellowish or turbid indicates growth. until consecutive BI's show no growth. Consult local rules before making purchase. Complete Instructions included. Easy to use. 1. Place one ampoule (BI) in a pouch and autoclave the pouch in a typical load. 2. Remove the pouch after the cycle and remove the BI from the pouch and label it. 3. Take a non-processed BI (not autoclaved) label it as "Un-processed"
4. Turn on the Incubator and allow to heat up for 10 minutes. Check thermometer reading is within the range of 55-60C. 5. Place both BIs in the incubator holes. 6. Remove both after 24 hours. The non-sterilized tester BI will have turned yellowish indicating growth. The sterilized BI should still be bluish (if sterilization was successful). If your sterilize BI has not changed color but remains bluish-purple you have passed biological testing. Keep a written record of your tests to meet any regulations. Clean-up: Sterilize both BIs and discard in normal trash if you passed the test. If you failed, hold both in a safe place until you can pass a test and then sterilize the BIs. BIs purchased in bulk are for for In-House testing only and cannot be sent to Unimax for testing. Do not send in-house tests to Unimax. Everything you need. Results in 24 Hours.